Valentine's day is all about chocolate, romance, chocolate, flowers, chocolate, poetry, and Valentine's chocolate recipes that you can share with your loved one. "If music be the food of love, play on…" William Shakespeare wrote in the play Twelfth Night (Act one scene one) and I'm not going to argue with the Bard, but I will say that chocolate is in the love food group. Regardless of what else you are serving to your lover for Valentine's Day dinner, these Valentine's chocolate recipes should be part of the plan. Start with the cookies and end with the Chocolate Marquise served with a cup of Bicerin. With this much chocolate on the table, love will definitely be in the air. Using a Bain Marie, melt the chocolate. Place the melted chocolate into the bowl of your stand mixer. Add the cocoa powder and 1/3 of the powdered sugar. Beat them until they are well blended. Add one egg white and beat until it is completely incorporated. Add another 1/3 of the powdered sugar, then add the next egg white. When these are completely incorporated, add the remaining powdered sugar, the last egg white, and the vanilla extract. Beat on a high setting until the batter is smooth, about two minutes. Turn off the mixer and let the batter stand for five minutes. If the dough seems too dry or is too crumbly to hold a shape, add a tablespoon of water or two. If the dough is sticky add a little more powdered sugar. The dough should be a bit more dry than sticky. Place one half between two sheets of parchment paper and carefully roll it out to ¼ of an inch thick. Carefully peel off the parchment from one side and then gently place it back. Flip the dough over and peel off the top piece of parchment. Using a 2-inch heart-shaped cookie cutter, cut out as many cookies as you can. It is a bit helpful if you have a small amount of powdered sugar handy to dip the cutter into to keep the cutter from sticking to the cookies. Carefully place the cookies on a cookie sheet that has been lined with a sheet of parchment paper. The dough will be soft and you might need to use a spatula to lift and move them. You can re-roll and re-cut any unused dough. Bake for about ten minutes or until the top of the cookie looks dry, no more than 13 minutes. Dust the tops of the cookies with powdered sugar. Butter a small, 8 x 4 inch, loaf pan. Line the pan with two sheets of plastic wrap, making sure there is plenty of wrap overhanging the sides of the pan. The two layers of plastic are there to make the removal of the chocolate easier. Melt the butter and the chocolate in a Bain Marie over low heat. Once the chocolate is melted and smooth, remove the chocolate from the heat. Beat in the sugar, then beat in the egg yolks. You can use a whisk or a hand mixer for this step. Using your stand mixer, beat the egg whites just to stiff peaks. Gently (GENTLY) fold one third of the egg whites into the melted chocolate. Then gently fold another third of the egg whites into the chocolate. Finally, fold in the last third of the egg whites. Once all the egg whites have been just blended, stop folding. Gently (this is the word of the day here) pour the chocolate mixture into the prepared pan. Cover the chocolate with the overhanging plastic and place into your freezer for at least 6 hours. Fifteen minutes before you want to serve your Marquise, take it out of the freezer. Unwrap it and pop it out of the pan. If the Marquise is stuck, heat an offset palette knife in hot water and run it around the edges of the pan. If the Marquise is not smooth, use the warmed palette knife to smooth out the surface. Heat a long thin knife in hot water and use this to slice ½ inch thick slices from the loaf. 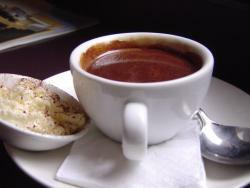 This seductive shot of hot chocolate comes from Turin, Italy. Bring the milk just to a boil and then remove from heat. Pour coffee into a heatproof bowl and melt the chocolate into the coffee. Add the sugar to the coffee/chocolate mix. Whisk until it is smooth. Whisk in the hot milk. Taste and adjust the mix for sugar. Top with a small bit of shaved chocolate or a dusting of cocoa powder.